Most all of us have seen the unsightly and dangerous results of cracking concrete. Discovering cracks is quite disheartening, especially if you laboured diligently to put down the concrete yourself. Unfortunately, do-it-yourself concrete projects often result in breaks. It is crucial to use correct techniques throughout the process of laying concrete to avoid cracks; a professional is really your best choice when your project involves concrete work. When you aim to avoid cracking, it is helpful to understand a little about concrete, itself. Concrete’s strength is universally recognised. This strength is what makes it such a useful material for building. Generally speaking, concrete has a higher compression strength (the ability to resist forces pushing together- compression) than a tensile strength (resistance to being pulled apart-tension) typically the tensile strength is 10% of the compression strength. It is this lacking in tensile strength that most often leads to concrete cracks. Another trait of concrete is its low tolerance of thermal expansion. As concrete heats, for example in the mid-day summer sun, it absorbs the heat’s energy and converts it into kinetic energy within the concrete. While the movement of the kinetic energy, is unseen, it causes small cracks inside the concrete. Over time the small cracks become sizeable and noticeable. Concrete must mix with water in order to form a pourable substance. Working with properly mixed concrete is imperative. 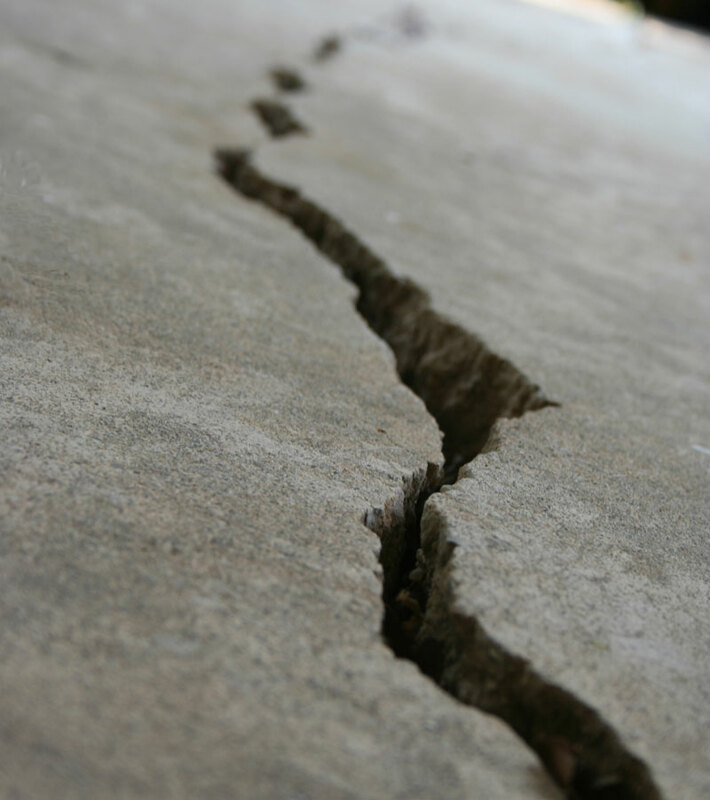 If your concrete is too wet, cracks are virtually guaranteed to develop. The cracking occurs because the excess water mixed in with the concrete evaporates and causes the concrete to shrink from its initial place. 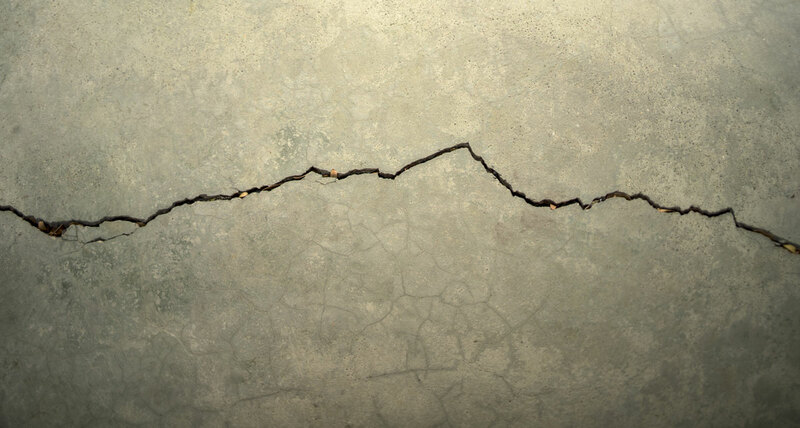 The majority of cracks you see in concrete will not adversely impact the structural integrity of the concrete. They do create a very unattractive look and also can be a hazard if the cracks raise or lower parts of a surface such as a sidewalk or a path. Once you have a basic understanding of some of the characteristics of concrete, you are better equipped to deal with potential problems and avoid some specific issues that lead to cracks in your concrete. Here are some recommendations that will help you steer clear of cracks in your future concrete projects. There are various ways to reinforce concrete in your project. Many people find the idea of cutting the cost of a job a tempting way to save a little. However, you can feel sure that whatever money you save because you chose not to reinforce the concrete, will not equal the aggravation and extra work that come hand in hand with cracking concrete. Steel reinforcements– This includes steel bars, rio mesh, and infusing concrete with steel fibres in specific areas. Glass fibre reinforcements– Adding glass fibres to a concrete mix increases tensile strength and helps to avoid cracking. Natural fibre reinforcing agents- Natural fibres are a great way to reinforce concrete. Not only do they create a durable product, but recycled materials such as old carpet are also useful for this sort of project. Another beneficial natural fibre used in concrete reinforcement is cellulose fibres created from pine trees. Expansion filler– This product comes from of various materials, and it can quickly fill in small spaces in your concrete, especially corners. As the name suggests, it conforms to the interior of a concrete structure. Flame retardant expansion filler is a very popular material, especially in a family dwelling place. Adding control joints to your concrete project is a helpful way to prevent random cracks throughout your project by giving the concrete an already weakened place to crack. To create a control joint, saw into the slab at intervals no greater apart than three meters. When mixing concrete, remember there are products designed to make the job easier. One such product is known as a low-shrinkage aggregate. Another way an aggregate can help in your quest to avoid cracks is if you use the maximum amount of coarse aggregate that is practical for your project. It is imperative for you to avoid a very wet concrete consistencywhen you mix it. Always begin the mixing process with the lowest amount of water needed to make a workable mixture that allows you to place the concrete. The surface where you place the concrete needs to be as compressed as possible. Additionally, be sure to look for any debris in the area you are working. Things like tree roots or old building materials eventually decompose and leave gaps in the ground. Likewise, pest infestations will create unwanted spaces between your concrete and the ground. Both kinds of ground disturbances will lead to uneven surfaces and cracks. Additionally, these cracks can lead to water pooling at your foundation. This goes hand in hand with ground consolidation, you must be sure that the area you are laying the concrete is smooth and level. Also, be aware of the drainage options for the area. While you cannot control the weather, it is wise to consult the local forecast when you are planning a project. 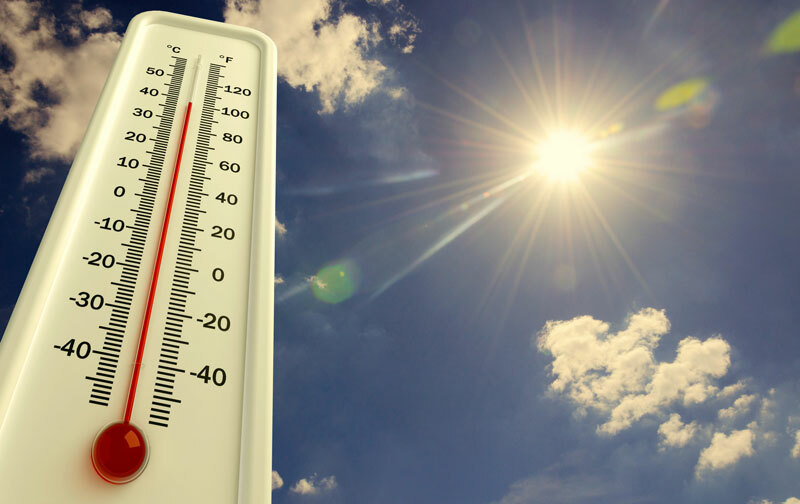 As much as it is up to you, avoid pouring concrete during extreme temperatures. Installing windbreaks to shield the new concrete can help prevent damage as well as adding white pigment to curing compounds to reflect excessive sunlight. You want to be sure that your concrete does not end up losing moisture too quickly as this is a sure-fire way to crack concrete. 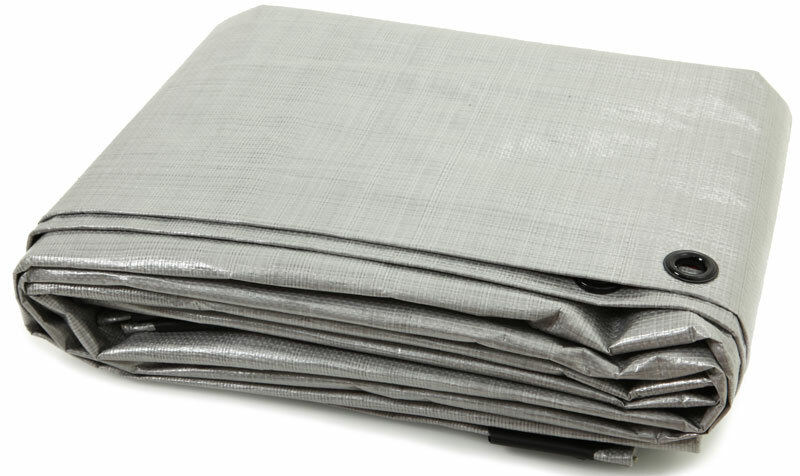 Covering the wet concrete with sheets of plastic can ensure that dampness leaves the concrete at a slow rate. Using a curing agent can also help you to control the concrete moisture level during the curing process. Regardless of where your concrete is, you will want to protect its beauty and value. Many contractors and engineers believe cracks in concrete can occur no matter what regardless of precautions and preplanning. Following these guidelines and consulting with an expert in the field are two good ways to prevent cracking in your concrete. For more on information you need to know about laying concrete feel free to give our team at Decorative Concrete WA a call, arrange a chat or quote. We promise to make your concreting dreams a reality. Interested in our services? Get a quote from the concreting experts!